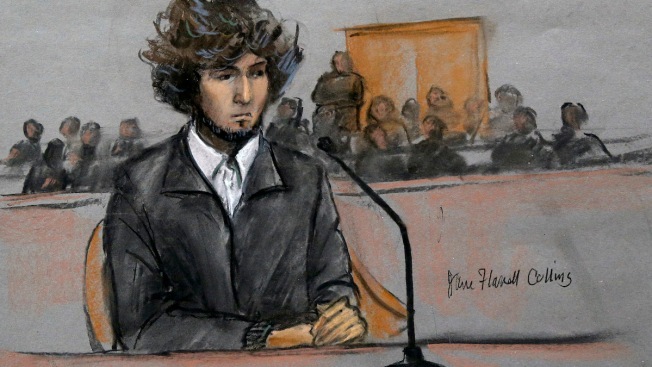 Prospective jurors who made it through the first round of cuts in Boston Marathon bombing suspect Dzhokhar Tsarnaev's federal death penalty trial face individual questioning as the second phase of jury selection begins Thursday. More than 1,350 people were called to court last week to fill out lengthy juror questionnaires. Tsarnaev's lawyers and prosecutors were due to submit a list of jurors both sides agree should be excused, but that number was not immediately released publicly Wednesday. When individual questioning begins Thursday, Judge George O'Toole Jr. will do most of the inquiry, but the judge has said Tsarnaev's lawyers and prosecutors will be allowed to ask some follow-up questions. Tsarnaev, 21, is accused of carrying out twin bombings near the finish line of the 2013 marathon. The blasts killed three people and injured more than 260. On Wednesday, O'Toole rejected a bid by Tsarnaev's lawyers to suspend jury selection because of the potential impact of last week's terror attacks in Paris. Tsarnaev's lawyers argued that the French terror attacks had placed the marathon bombings "at the center of a grim global drama." They said delaying jury selection for at least a month would allow some time "for the extraordinary prejudice flowing from these events - and the comparison of those events to those at issue in this case - to diminish." In a brief written ruling, O'Toole said his review of jury questionnaires "has so far confirmed, rather than undermined, my judgment that a fair and impartial jury can and will be chosen to determine the issues in this case." The questions asked on the 28-page jury forms has not been made public. Legal analysts said that both prosecutors and Tsarnaev's lawyers will be looking to get a snapshot of the life experiences and attitudes of prospective jurors when they are questioned individually. "It's hard to pigeonhole particular types of jurors. It's going to come down to specific answers to specific questions and getting a sense of whether this juror is the right juror to hear this case," said former U.S. Attorney Donald Stern. "The stereotypes that lawyers and some jury consultants use I don't think really apply in this case." Frank Libby, a former federal prosecutor who is now a Boston defense attorney, said individual questioning helps lawyers on both sides explore the backgrounds of prospective jurors and the decisions they've made in their lives. "As a prosecutor, you want to have somebody who is adult, grown-up, had some experience in life, perhaps has some ups and downs, someone who understands that actions have consequences, and they've had exposure to making tough decisions," Libby said. "From the defense side, you certainly want to find the maverick, the mustang, somebody who's not averse to going his or her own way and standing their ground," he said. The judge has said he expects to question about 40 prospective jurors each day until enough people have been qualified to move to the final phase of jury selection, when both sides will be allowed to eliminate a certain number of jurors without stating a reason. Each side has 20 such peremptory challenges. A panel of 12 jurors and six alternates will be chosen. Testimony is expected to begin Jan. 26.